I've lived in Oregon my entire life. Traveling is one of my favorite things to do, but I love coming back to our rainy, moss-covered home. 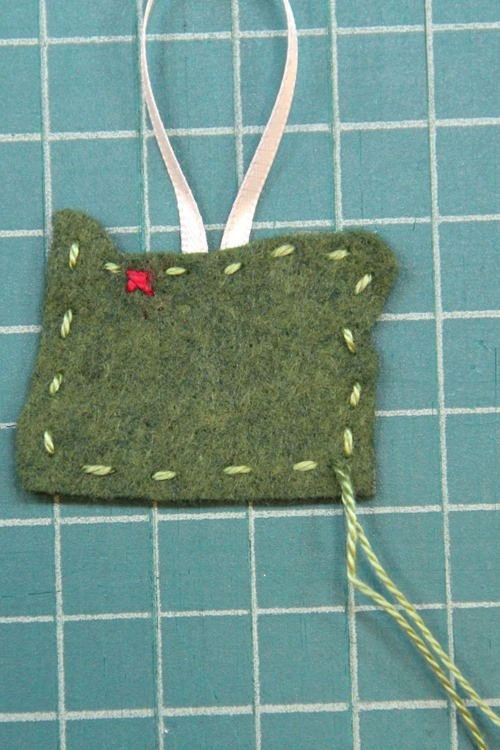 I wanted to make an ornament to remind our wandering son of where his roots (and a lot of his stuff) still are, so I thought an on-the-nose outline of Oregon was going to be a hard hint to miss. 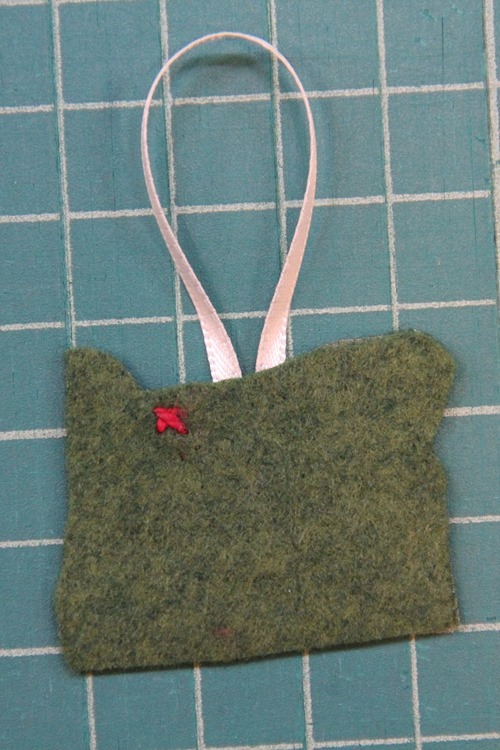 This one is on it's way to Italy, but I think my tree is going to need one too. an outline of the state you'd like to make, sized to about 2 or more inches on its longest side. This is a good resource for the outlines. 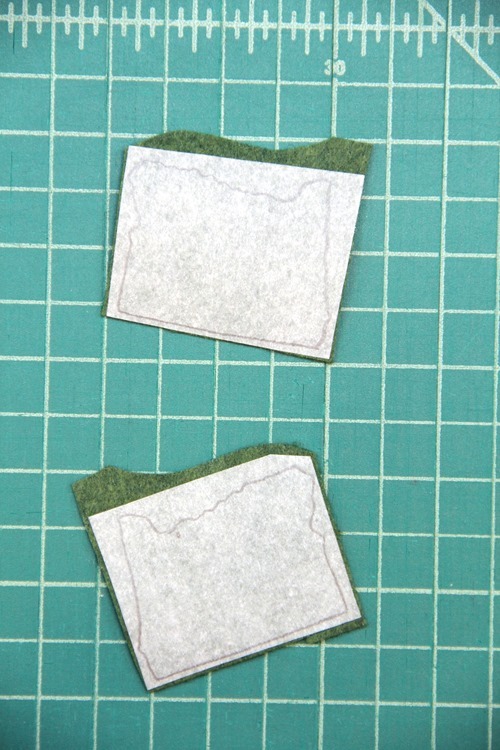 Trace the state outline onto the paper side of the iron-on adhesive. Flip the state over and trace it again so you have two that are opposite each other. Iron the adhesive side of each onto the felt. I added a little bit of stitching in the spot where our hometown of Boring is. I intended to make it a heart, but it was too tiny to pull that off. Instead, I went with a little X-marks-the-spot. Peel the paper off both pieces. Cut a 5 1/2" piece of the ribbon. 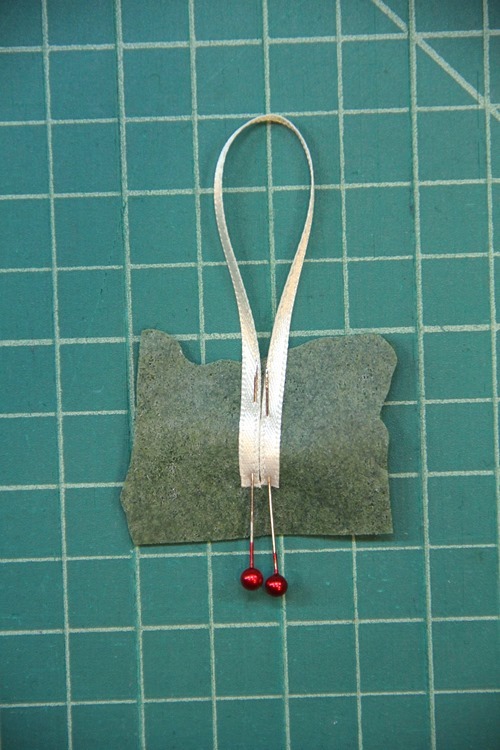 Loop the ribbon and pin it to the adhesive side of the back piece, making sure the ends of the pins are sticking out past the edge of the ornament so they can be easily removed. Add the front piece on top, adhesive side down. Press, removing the pins. 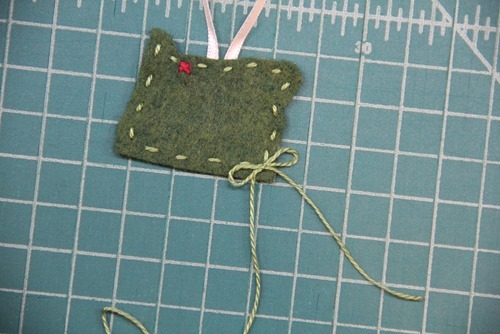 Choose a point to start stitching around the edge with embroidery floss. This is where the bow will end up. Rather than knot the thread, leave a few inches at the beginning. Stitch all the way around until you're back where you started. Tie the two ends into a bow. Trim the tails. If you're concerned about it coming untied, dab a small bit of glue on the knot. A little piece of home for the tree. Imagine one of these for every state!